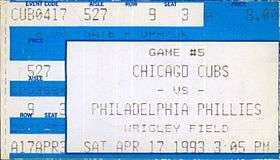 A ticket for a 1993 game between the Philadelphia Phillies and the Chicago Cubs. The 1993 Philadelphia Phillies season saw the team win the National League East championship. The Phillies defeated the Atlanta Braves in the 1993 National League Championship Series in six games, before losing the World Series to the Toronto Blue Jays. After finishing in last place the previous year, the Phillies took the lead in the National League East Division on opening day and never relinquished it, as they clinched the division title on September 28 in Pittsburgh. The 1993 Phillies were led by stars Darren Daulton, John Kruk, Lenny Dykstra, and Curt Schilling. The team was often described as "shaggy", "unkempt", and "dirty." The previous year, noting the presence of the clean-cut Dale Murphy, Kruk described his team as "24 morons and one Mormon." Their character endeared them to fans, and attendance reached a record high the following season. As a play on the legendary 1927 New York Yankees' Murderers' Row, the team's scruffy, mullet-wearing look was dubbed "Macho Row." To the surprise of their city and the nation, the Phillies powered their way to a 97-65 record and an NL East Division title. Their 97 wins were the most since their back-to-back 101-win seasons in 1976 and 1977. They had a formidable batting lineup, leading the National League in at-bats (5,685), runs scored (877), hits (1,555), doubles (297), walks (665), on-base percentage (.351), and total bases (2,422). Center fielder Lenny Dykstra batted .305 and led the league in hits, with 194, and runs scored, with 143, both career-highs; he also set career-highs in home runs (19) and RBI (66). Left fielder Pete Incaviglia hit 24 home runs and drove in 89 runs in only 368 at-bats. Catcher Darren Daulton also hit 24 home runs and drove in 105 runs, topping 100 for the second consecutive season. Steady-hitting right fielder Jim Eisenreich led the team with a .318 batting average and struck out only 36 times in 362 at-bats. First baseman John Kruk batted .316 and hit 14 home runs with 85 RBI, while third baseman Dave Hollins drove in 93 runs for the second straight season. The Phillies also had one of the best pitching staffs in the Major Leagues that year, leading their league in complete games (24), innings pitched (1,472.2) and strikeouts (1,117). Each of their five starting pitchers had at least one shutout during the regular season. Curt Schilling and Tommy Greene each won 16 games, Ben Rivera won 13, and Danny Jackson and Terry Mulholland won 12. Closer Mitch Williams walked 44 batters in 62.0 innings, but had a solid 3.34 ERA with 43 saves and averaged only one home run allowed every 20.2 innings pitched. During the season there were a multitude of memorable moments. In late April, the team rallied from an 8-0 deficit to defeat the San Francisco Giants 9-8 in 10 innings, spurred when Giants reliever Bryan Hickerson slammed the ball to the ground to celebrate an out. In San Diego, a few days later, left-fielder Milt Thompson saved a game by making a leaping catch on a potential grand slam by the Padres' catcher Bob Geren. Terry Mulholland hurled the first shutout in Mile High Stadium, as the Phils swept the expansion Colorado Rockies in late May. On July 2, the Phils and Padres played a doubleheader that lasted almost 12 hours with rain delays; Mitch Williams won the second game with an RBI single at 4:41 AM. Five days later, Lenny Dykstra ended a 7-6, 20-inning game against the Dodgers at Veterans Stadium with a ground-rule double. A three-game sweep of the St. Louis Cardinals to end July effectively pushed the Redbirds out of the pennant chase, and Danny Jackson's 12-0 rout of Cincinnati on August 29 left the Cards 10 games out and the Expos 10 1⁄2 out with one month to go. However, a September slip caused some columnists in the city to compare the club to the infamous 1964 team. They lost five of seven games at home to the Cubs and Astros, then lost two of three at Olympic Stadium, which brought Montreal within four games with 13 remaining. Ground ball, it's a fair ball! Kruk to Pall ... the Phillies are the '93 National League Eastern Division Champions! This wonderful band of throwback players have won the National League East, mobbing one another on the field. April 13, 1993: Brad Hassinger (minors) was traded by the Phillies to the Atlanta Braves for Mark Davis. June 1, 1993: Juan Bell was selected off waivers from the Phillies by the Milwaukee Brewers. Wayne Gomes was drafted by the Phillies in the 1st round (4th pick). Player signed July 27, 1993. Scott Rolen was drafted by the Phillies in the 2nd round. Player signed July 22, 1993. July 2, 1993: Mark Davis was released by the Phillies. July 3, 1993: Tim Mauser was traded by the Phillies to the San Diego Padres for Roger Mason. August 10, 1993: José DeLeón was traded by the Phillies to the Chicago White Sox for Bobby Thigpen. The series' first game sent two staff aces -- Curt Schilling for Philadelphia and Juan Guzmán for Toronto—against one another. The result was less than a pitcher's duel, however, as both teams scored early and often. The deciding plays came in the middle innings. With Toronto behind 4-3 in the 5th inning, Devon White hit a solo home run to tie the game. The next inning, John Olerud hit a solo home run of his own to put Toronto on top. Toronto added three insurance runs in the bottom of the 7th and held on to win 8-5. Al Leiter pitched 2⅔ innings—in relief of a sporadic Juan Guzman, who walked four in just five innings—for his first World Series win. John Kruk had three hits for Philadelphia. In the second game of the series, Dave Stewart was on the mound for Toronto and Terry Mulholland started for Philadelphia. Philadelphia jumped out to an early lead: in the third inning, Jim Eisenreich followed John Kruk and Dave Hollins RBI singles with a three-run home run to deep right-center. Toronto got on the scoreboard in the fourth inning courtesy of a Joe Carter two-run home run to left, but the Jays were unable to mount a significant offensive push later in the game. Philadelphia held on to win 6-4. Terry Mulholland pitched 5⅔ innings, allowing 3 earned runs, for the win. Toronto fought back from a 14-9 deficit in the 8th inning, scoring six runs on run scoring hits from Paul Molitor, Tony Fernández, Rickey Henderson, and Devon White. Duane Ward pitched the final 1⅓ innings, preserving the 15-14 victory. Three new World Series records included the longest game at four hours fourteen minutes (4:14), most runs by both clubs with twenty-nine (29), and runs scored by a losing team with fourteen (14). Also, Charlie Williams became the first African American to serve as the home plate umpire for a World Series game. The offenses were due for an off-day, and it came in Game 5 courtesy of a Curt Schilling (Philadelphia) and Juan Guzmán (Toronto) pitching duel. Schilling shut down the previously unstoppable Toronto offense, limiting the team to just five hits and no runs. Guzman pitched well in a losing effort, allowing only two runs and five hits in seven innings of work. In the 7th inning, Philadelphia fought back with five runs to take a 6-5 lead. Lenny Dykstra hit a three-run home run, Dave Hollins had an RBI single and Pete Incaviglia hit a sacrifice fly. The inning brought an end to Dave Stewart's night, leaving the game with 6 innings pitched and 4 runs given up. Philadelphia closer Mitch Williams came on to the pitch the bottom of the 9th with Philadelphia clinging to a 6-5 lead. After beginning the inning by walking Rickey Henderson, Williams tried to counter Henderson's speed by pitching out of a slide-step style of pitching delivery. Prior to Game 6 of the 1993 World Series, Williams never used the slide-step delivery in his career. This may have cut back on the velocity of the hard throwing Williams. The walk to Henderson was followed by a Devon White fly out and a single by Paul Molitor. Joe Carter came up next and, on a two strike pitch, he hit an inside pitch just over the left field fence, giving the Blue Jays a come-from-behind 8-6 victory, and the World Series crown. ↑ Westcott, Rich (1994). Phillies '93: an incredible season. Philadelphia: Temple University Press. p. 73. ↑ Fitzpatrick, Frank (September 29, 1993). "A Grand Way to Win Duncan, Phillies Clinch NL East". Philadelphia Inquirer. p. D1. 1 2 "1993 Philadelphia Phillies Schedule, Box Scores and Splits". Baseball-Reference.com.